Yesterday, I wrote a glowing post about my experience securing free Economy Comfort seats on KLM for an entire upcoming itinerary from New York to Cape Town via Amsterdam when booking through Delta thanks to my Platinum Medallion status. Little did I know the issues I was in for…as you’ll find out in this video I made explaining it (I apologize for the quality – I am out in the country and only have my iPhone to film on today), then read on for the details of what happened to me and what you can do if this situation comes up for your own travel plans. My trip had come up at the last minute, but I was excited to book an economy ticket for about $1,500 roundtrip – especially since I knew I could get more spacious Economy Comfort seats with my status. I know I always talk about business and first class because I’m so tall and I have trouble fitting in coach seats, but I’ve flown KLM’s Economy Comfort before and find it very…well, comfortable, thanks to more legroom and recline…so my JFK-AMS-CPT itinerary seemed like a good choice to me. KLM’s Economy Comfort is a decent option for me, even for long-hauls. Before booking, I had called up Delta to make sure Economy Comfort seats were available for all four flights and the friendly agent I got told me that they were open on all of my flights and that she could ticket me in them, so I went ahead and booked, figuring I was all set (and saving me over $600 all told). However, a lot of readers commented on the post and Tweeted me that I might want to double check my seat assignments on KLM since they had always had issues booking KLM tickets through Delta. So I went back into my reservation on KLM and lo and behold, I had lost my Economy Comfort seat assignments! Little did I know that this was just the start of my troubles. 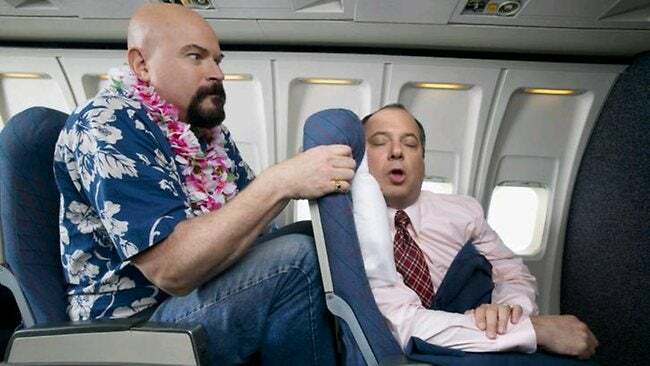 It turns out I’d been given middle seat assignments in coach on 3 of my 4 flights, which is my worst travel nightmare – especially when there are 9- and 11-hour flights involved. I absolutely would not have purchased my tickets if I had known that this was going to be the case. This is pretty much my worst travel nightmare. Photo from Thinkstock. So I called Delta to find out what had happened, whether they could help me fix the situation, and what I could do. I was told by a phone rep that they could not do anything over the phone for me, so instead I tweeted @DeltaAssist, which is normally great and very quick to respond to customer service needs. They were indeed quick, but the news was not good. Economy Comfort was not available for one of my flights, and for the other three, the only Economy Comfort seats available were all middle seats. That was not what I signed up for, so I asked @DeltaAssist if they could do anything further, and they responded that they had forwarded the request on to KLM but that there was nothing else they could do from that point. So this partnership is clearly not as tight as I thought and SkyTeam marketing would have us all believe. I asked what my other options were and since my dates were flexible and there were Economy Comfort seats on flights on other days, Delta said it would waive the change fees for my flights, though I would have to pay any fare difference (luckily there didn’t seem to be any), and they went ahead and did that for me. 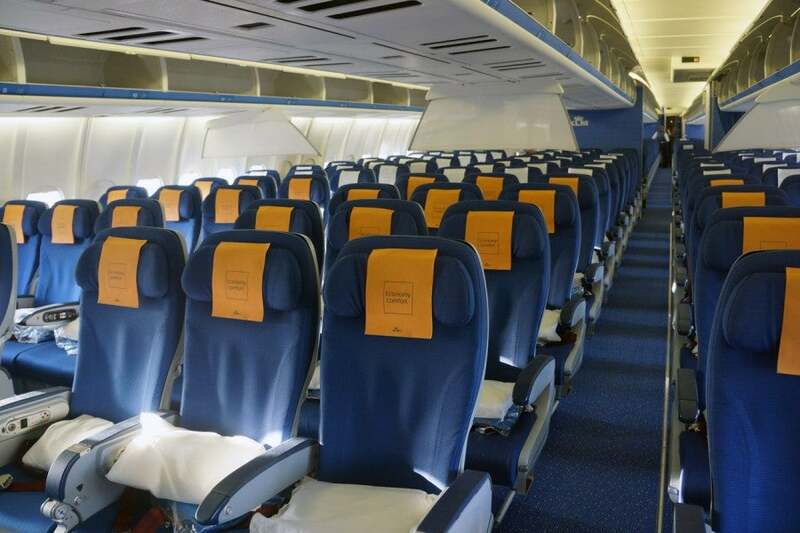 However, they still could not issue confirmed Economy Comfort seat assignments, saying that KLM had blocked the seats. They basically sent me on my way to fend for myself, so I contacted KLM immediately via direct message on Twitter. Here’s where I felt like I started going down the rabbit hole. 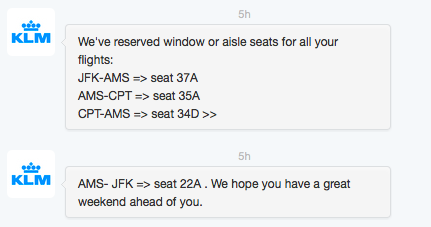 After I tweeted KLM and got them to follow me on Twitter so we could direct message each other (which took several hours), I sent them my request including specific seat assignments that I could see were open on my flight in Economy Comfort on aisles. When they messaged me back, they had assign some window and some aisle seats in the main economy cabin. What! At this point I was flabbergasted, but I kept my cool and messaged them again politely asking them to re-read my request. I waited with bated breath to see if everything would work out, and thankfully, after a while of radio silence, someone got back to me with the seat assignments I had asked for. Phew! So now I’m pretty sure I’m set for my trip…but you can bet I’ll be checking on my seat assignment every few days to be sure there are no changes to it! I want to thank the readers who reached out to me with words of caution, and I also wanted to share my experience in detail for any of you who were thinking of booking similar flights on KLM through Delta and were counting on Economy Comfort seat assignments since this is definitely a big rigmarole and you don’t want to end up in the back of the plane. So stay tuned for my trip report, and thanks for sitting through my rant!